European styling and a competitive price makes the 4600 SCB a major marketing success for Maxum. The two-stateroom interior is arranged with a mid-level galley. Large windows provide panoramic views of the water. Corian counters, hardwood flooring and leather sofa dominates the salon. 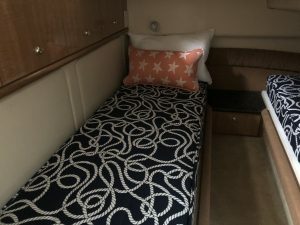 The Master has forward berth and guest stateroom has twin berths. We did custom mattress and Sunbrella slip cover for this client. As I always mention, we make everything custom to fit the size and shape of your particular bed. We specialize in latex for our mattresses and toppers. The reason because latex is mold and mildew resistant, very comfortable and flexible, sleeps cool, and does not absorb smell. Here, we have provided the customer with our 7” Commodore mattress. The Commodore is by and far our most popular model. Constructed with a 6″ Latex core and covered in an ultra-soft bamboo quilting, The Commodore is comfort. For our bedding, we carry a wide variety of fabrics that you can choose from. Our house fabrics can be viewed on our webpage. We also carry the Sunbrella Collection. Sunbrella has lately become the top most choice when it comes to marine. The fade resistant and color repellant qualities of these amazing fabrics have made them very popular for both indoor and outdoor use. We carry a wide selection of Sunbrella. Feel free to contact us and we will guide you to view the selection and will be more than happy to send swatches your way of your favorite ones. Here, we used our Sunbrella fabrics for slip cover and throw pillows. The vibrant color combinations and cool print and textures gives a refreshing look to these staterooms. This is a slight different approach then our quilted coverlets. Here, we are using a sunbrella slip cover on our custom 7” latex mattress in the master stateroom. The crisp patterned fabric looks great and is giving a finished look to the bed. 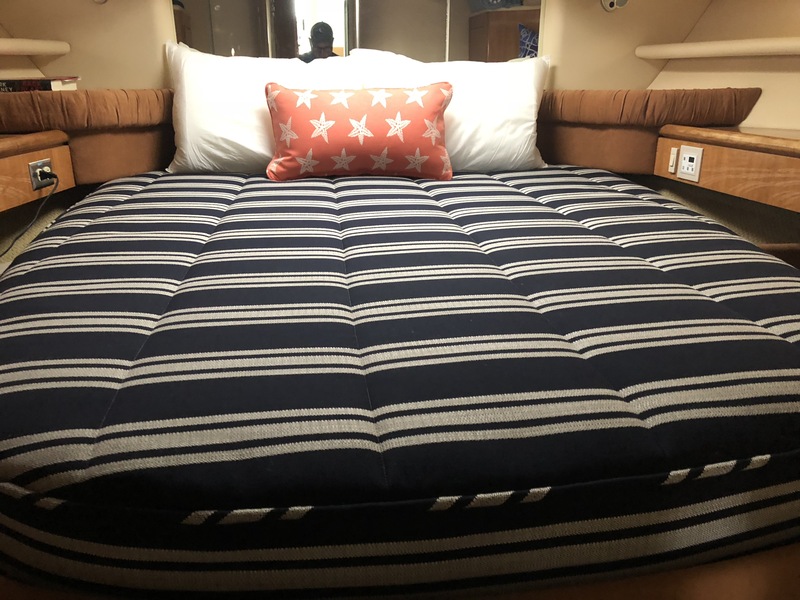 The bunks are actually custom nautical sunbrella slip cover mattress. Again, a very fresh and clean look. 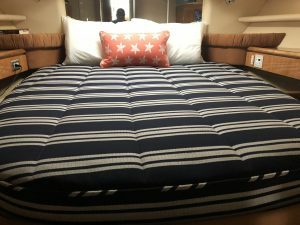 Our goal at Yachtbedding.com is to make the selection process easier for our customers and at the same time, provide them with variety in the simplest manner we can to transform your stateroom into a STATEMENT ROOM.